A traditional Buddha statue dating back to the 11th or 12th century. 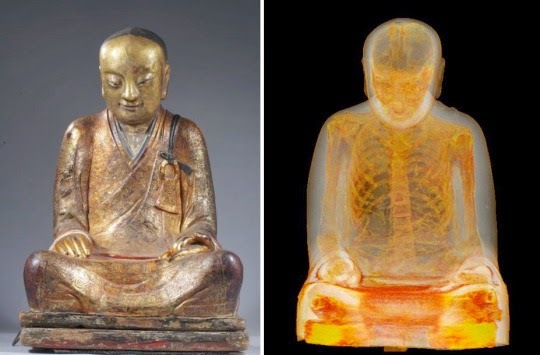 A CT scan and endoscopy carried out by the Netherlands-based Drents Museum at the Meander Medical Centre in Amersfoort, showed the ancient reliquary fully encases the mummified remains of a Buddhist master known as Liuquan of the Chinese Meditation School. While it was known beforehand the remains of a person were inside, another startling discovery was made during the scan: where the organs had been removed prior to mummification, researches discovered rolls of paper scraps covered in Chinese writing. 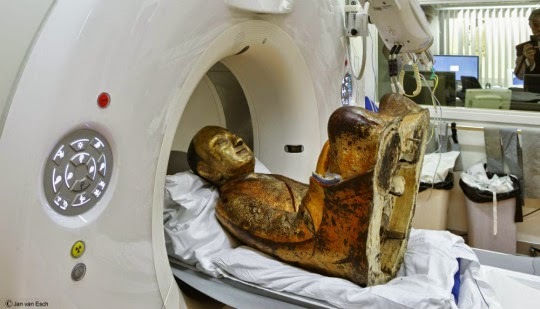 The Liuquan mummy has since been transported to Hungary where it will be on view at theHungarian Natural History Museum through May of 2015.